With the mouse, we will click and drag the ones we need to the bottom portion: the grid columns. As you do this, you will notice that the "Table" and "Show" rows are also filled automatically after we placed our selections in the first row. First, we need to choose an empty space and add a Title to it. How about "Total"? Total: [ ]*[ ] , it is important for us to respect the blank space after the colon ":". Inside the brackets , we will write the names of the field we want to use to calculate. 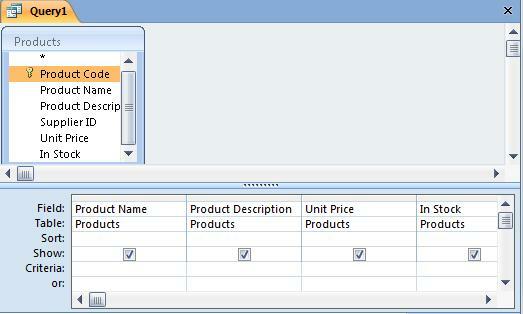 Finally, we need to select the slot "show" to be able to view the result of our operation after we Run our Query. We click on the "Run" icon, and this is the result. REMEMBER: I added dome values to the table before doing this. The values I added to the "Products" Table were the ones you see below.